I wrote and edited articles for the Travelex Hub, working with the Brand Manager to create content that achieved SEO goals, while being engaging and informative for audiences. I researched and wrote various content pieces for Travelex, including: surf travel, South American travel guides and tips for travelling solo. Website content and stories to engage consumer audiences. I wrote and edited content for National Advance Care Planning Australia. I researched, brainstormed and sourced stories to help educate and inspire everyday Australians to discuss advance care planning with their loved ones. One story included interview with Kate, volunteer with Advance Care Planning Australia. I write, edit and work on content projects, from long-form blogs articles, to content audits and SEO projects. 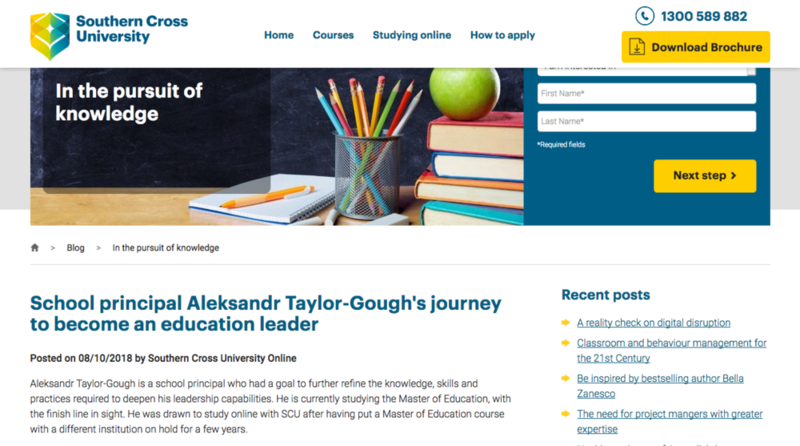 I wrote content for the Southern Cross University Online, including blog content, study brochures and EDM copy. Fill in the form below with some details on the project I can help with.